Exophase's GBA emulator, wiz port by notaz. just like you said!thank you Exophase!i m trying it right now! It runs okay but the sound has a lot of glitches. Also some times it locks up in the middle of a game and takes me to the wiz menue. Great speed, but year still some sound problems. Can i play it with fullscreen mode without that annyoning image quality? very poor definition. Thanks from Madrid!!! Works great - looks so crisp on the Wiz screen ! I like to set the screen option to "unscaled 3:2" so that the graphics don't get pixelated at all. If we get an update, could all the roms be run zipped? Can't wait for an update. Only problem is the diagonal tear across the screen. And the sound is a little fuzzy. BUT AMAZING EMULATOR!!!! WOULD DONATE MONEY TO THE CAUSE IF I KNEW WHERE TO DO SO!!! I feel weird getting something so amazing for free. @ tylonfoxx I put most of the Pokemon games on my Wiz. They all started up and played fine. What kind of problems did you have? Are those problems later in the game?? Or is it a technical problem with saving or something. Great emulator, can run most games, biggest issue i have with it is severe sound lag in most games. Like in Castlevania: Aria of sorrow,the minish cap, anyone have any fixes? Great emu. I've had no problems running the games I've tried. For example Spyro Orange runs glitch free and full apeed @ 533Mhz. Thanks for all the work! Running Wario Land 4 was fine. Runs at 60 fps almost all the time. Brings back lots of memories! However some of the sounds were slightly different. Super Mario Advance 3 Yoshi's Island was perfect, a few graphical glitches, but runs far better than the SNES version. WarioWare, Inc. runs fine, but there are a few graphical glitches. V-Rally 3 runs fine, but the smoke has black lines around it. All games tested at 800 MHz. This emulator is wicked. Thanks for it! 9/10. Mario Advanced 4 (SMB3) will not work. I select the start game option and then it goes back to the Wiz's main menu. Pokemon Emerald, Iridion II, Mario Tennis and Golf, Drill Dozer.. and a few more don't work either. Mario Advanced 4 works fine on mine. Pokemon and Sonic Pinball also don't work. @Deevoh Drill Dozer does work... to a certain point anyway, I got to certain point in Metal City and the game it kept freezing at the same spot. People need to stop complaining on the comments board. This emulator blows away many GBA emulators to date for handhelds! Nice emulator. It will play a many, but had trouble getting into the gameplay on: Mario & Luigi Superstar Saga, Ms. Pac Man Maze Madness, Haunted Mansion, Activision Anthology, Classic NES series. Can someone port this to caanoo? High standard emulator, only issues, crashes on kingdom hearts chain of memories(E) intro video, and loading in game is slightly delayed, other than that, good. @Coolotail: I can imagine it will be ported soon enough, but I just can't imagine playing GBA games on entirely an analog stick. Some will be alright - like RPGs - but I've played my friend's Caanoo a few times... I can't even play mario on it without epic-failing because you have to think about bringing the analog stick back to the other side. Even with deadzone alterations, it was a terribly poor design choice! GOLDEN SUN 1 works very fine. But... GOLDEN SUN 2 crashes at the beginning of the game, in the tower... I tried several roms, same... Can someone help me ? publifun -@- gmail.com Thanks ! I am having a hard time getting it to work! 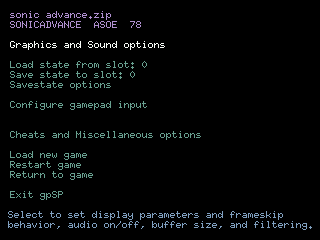 when I try to run a game, i says the a need a gameboy adv bios. can some one help. Everything i have downloaded works flawlessly so far and yes you need a bios but don't put it in a bios folder just put it in the root of the emu folder. THANKYOU,this is a work of art!! Sweet! I can run the Mother 3 fan translation on this! My only question is how do you activate cheats? I tried adding a .CHT database but it didnt do anything. People who don't know what a bios is or how to read a readme file should not have bought a WIZ. Go get a PSP or something and get mass media spoon-fed to you or something. This is a great emulator and takes minimal work to set up.